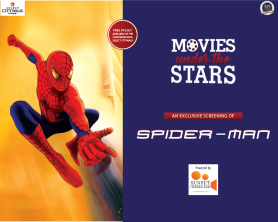 Movies Under The Stars brings to you the exclusive screening of Spider – Man at The Plaza, on Sunday 1st October, 6:30 PM! Come with your loved ones and grab a seat as we take you through the journey of Peter Parker. As the days get shorter and the autumn breeze gets cooler, this screening is the perfect way to cool off over the weekend.